Square Inc (NYSE:SQ) has been on fire this year, up a whopping 53%. Square continues to shake concerns of being overbought and overvalued. Case in point, SQ stock continues to hit one new all-time high after another. At the end of February, management gave investors another reason to be optimistic. The company beat on fourth-quarter earnings per share and revenue estimates. While the top- and bottom-line results look good, it’s even deeper than that. Gross payment volume vaulted 31% year-over-year, while adjusted EBITDA surged 38% year-over-year to $41 million. Looking ahead to 2018, CEO Jack Dorsey & Co. expect SQ to churn out EBITDA of $240 million to $250 million, a 76% acceleration vs. 2017’s result of $139 million and an increase from its previous guidance. Further, management is looking for non-GAAP earnings per share of 43 cents to 47 cents for the year. At the midpoint, this represents 66% growth from 2017. Finally, management is looking for adjusted revenue growth of 37%. That’s down 1,000 basis points from 2017’s 47% year of growth, but it’s still pretty darn impressive. More sales, increasing profit and widening margins? Count me in. One issue with SQ stock is its valuation, however. While the company continues to raise, then clear the bar, its stock isn’t cheap. If I had been long since $10 or $15 per share, I wouldn’t let the increasing valuation rattle me too much. As a prospective new buyer though, valuation is certainly a concern. Shares trade at 70 times 2019 earnings estimates and more than 9 times Square’s trailing twelve months of sales SQ stock trades at more than 80 times EBITDA. Last April it had a market cap of $6 billion. Now it’s over $20 billion. Following the stock’s massive run, should we think twice before buying? Revenue growth estimates of 37% this year and 28% (likely too low) in 2019 are good. Earnings are forecast to grow 66% in each of the next two years, which again, is great. Despite that growth though, SQ stock is overvalued based on 2018 and 2019 expectation. But the thought it is, buying now will allow long-term investors to have a reasonable cost basis in a long-term business. It’s like a much smaller version of Amazon.com, Inc. (NASDAQ:AMZN) or Netflix, Inc. (NASDAQ:NFLX). As small- and medium-sized businesses continue to grow, SQ will increasingly become a larger part of their ecosystem. The fact that it’s getting into bitcoin may allow for even more opportunity as well. Although PayPal Holdings Inc (NASDAQ:PYPL) will be ending its relationship with eBay Inc (NASDAQ:EBAY) in the distant future, the stock is a reasonable alternative to Square. Analysts expect 16% revenue growth this year and next, along with roughly 20% earnings growth each of the next two years as well. For this, we are paying just 29 times 2019 earnings estimates. Square stock isn’t the most overvalued name we’ve ever seen. But after its 210% rally over the past year, it’s far from cheap. With that in mind, let’s take a look at the charts. In November, SQ stock price went parabolic, rising from $35 to more than $50 per share. The 43% rally in just a few week’s time was way too aggressive. Not surprisingly, shares were back at $35 by year-end. However, that pullback was very important, because shares held onto long-term trend-line support (in blue). This trend has been in place for nearly a year now, beginning in April of 2017. Now near $42 and trending higher, I would expect this level to continue acting as support into the future. I would also be a buyer when SQ stock retests this level. A break below would signal that it’s time to be cautious, unless other support levels come into play. Do any other support levels exist? As a matter of fact, they do. Now that SQ stock is at $53 and over a big level of resistance at $50, look for that $50 level to now act as support (black line). The best setup we could imagine would be further rallying and consolidating, before pulling back toward $50. 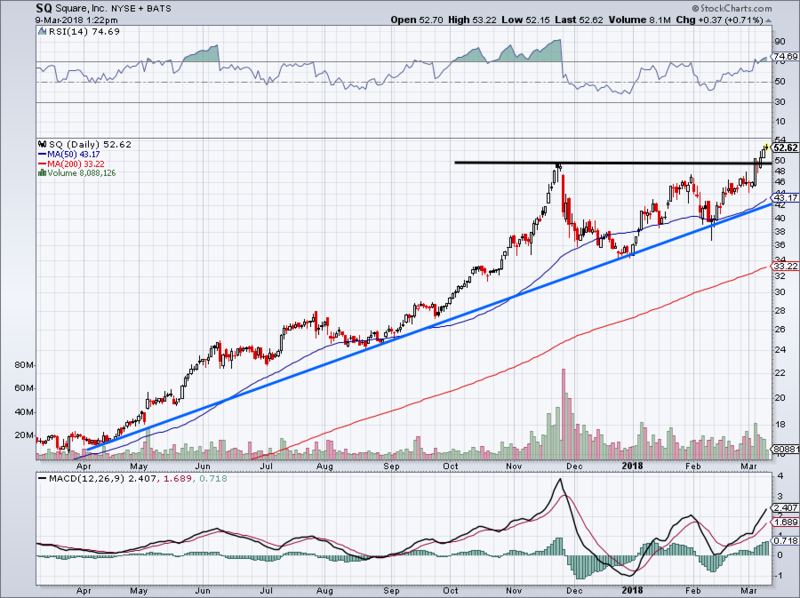 As time goes on, it will allow trend-line support to catch up to SQ stock price. If we can buy Square stock at ~$50 with both trend-line and $50 support nearby, it would setup SQ for a high-probability bounce. Article printed from InvestorPlace Media, https://investorplace.com/2018/03/trading-sq-stock-breakout/.